Protein Blend (Pea Protein Isolate, Rice Protein Isolate, Artichoke Protein Powder), Fructose, Natural Chocolate Flavor, Natural Peanut Flavor (Roasted Peanut, , Dextrose), Cocoa Powder, Guar Gum, Stevia, Glycine, Silica. Protein Blend (Pea Protein Isolate, Rice Protein Isolate, Artichoke Protein Powder), Fructose, Cocoa Powder, Natural and Artificial Flavors, Guar Gum, Sodium Chloride, Glycine, Stevia. Add one scoop to 8-10 oz. of cold water or your favorite beverage in a shaker cup or blender and mix for about 10 seconds. Consume 1 serving once daily. 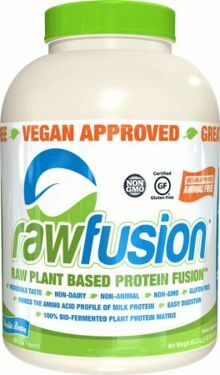 RAWFUSION also works great for baking (for added protein), with oatmeal and/or with fruit juices. Protein Blend (Pea Protein Isolate, Rice Protein Isolate, Artichoke Protein Powder), Natural Flavors, Xylitol, Guar Gum, Steviol Glycosides, Glycine. Protein Blend (Pea Protein Isolate, Rice Protein Isolate, Artichoke Protein Powder), Fructose, Natural Banana Flavor, Natural Peanut Flavor, Natural Peanut Flour, Guar Gum, Sodium Chloride, Steviol Glycosides, Glycine. The Raw Fusion amino acid profile contains over 4,900 mg of BCAA's (Leucine, Isoleucine, Valine) per 1 scoop and mimics that of whey/milk and is rich in Glutamine. The Raw Fusion patent pending formulation by SAN is free of solvents, radiation, artificial colors, sweeteners or anything created synthetically. Each and every ingredient is carefully extracted from pure organic raw ingredients that are GMO, herbicide and pesticide FREE. It’s up to you now. Make this day count. Make this decision matter. Step up onto the winner’s platform with Raw Fusion.